Oscar Movie: "The Lord of the Rings: The Fellowship of the Ring"
It's Bilbo Baggins' (Ian Holm) 111th birthday and Gandalf (Ian McKellan) has come to the shire to help celebrate. After his party, Bilbo is planning to retrace his steps to The Lonely Mountain and leaves all his things to his nephew Frodo (Elijah Wood), including the magic ring that he found in Golum's cave. Galdaf has his suspicions that there is more to the ring than what is known, and he soon discovers that the ring is actually the One Ring of Power made by Sauron. Sauron's ringwraiths have been sent to find it and kill whoever has it. Sauron finding the ring could mean an end to all good in Middle Earth. Gandalf sends Frodo and a small group of hobbits to Rivendale to hopefully keep the ring from Sauron. Once in Rivendale, the council decides that the ring must be destroyed, but the only way to do so is in the fires of Mount Doom. Since the ring corrupts those who carry it, it is dangerous for it to be carried by powerful beings. Frodo has shown great resistance to its power, so he agrees to carry it himself to Mount Doom in order to destroy it. A ranger name Aragorn (Viggo Mortenson), an elf named Legolas (Orlando Bloom), a Dwarf named Gimli (John Rhys-Davies), a man named Boromir (Sean Bean), Gandalf and Frodo's hobbit friends all agree to help get Frodo there safely, forming the fellowship of the ring. As far as a movie series goes, "The Lord of the Rings" is one of our favorites, and rightfully so. Everything about each of the films in this initial trilogy is magical and without many flaws. "The Fellowship of the Ring" is a fantastic kick-off to a wonderful trilogy. It is a true fantasy epic adventure on the grandest of scales. The details and work that went into creating each character is really magnificent. Peter Jackson managed to bring Tolkien's Middle Earth to life with tremendous sets and spectacular makeup, as well as a masterful forced perspective shooting technique. This first installment does a great job really introducing you to the world of Hobbits and their lifestyle, as well as the rest of Middle Earth. The Shire is beautiful, green and lush. It really is a fabulous sight as it appears on screen for the first time. Jackson develops each of the characters, which are perfectly portrayed by their respective actors, from Frodo to Legolas, down to the very last elf and hobbit. Though Elijah Wood can get whiny from time to time, this is hardly a huge complaint. Frodo grew up hearing of his Uncle Bilbo's adventure to the Lonely Mountain and is a good-hearted young man. Samwise Gamgee, played by Sean Astin, is Frodo's friend and gardener who is extremely loyal and brave. Frodo's cousins Merry, played by Dominic Monaghan, and Pippin, played by Billy Boyd, serve as more of a comic relief and are all around screw ups, but always seem to redeem themselves. Outside the main four Hobbits, Ian McKellan does a superb job as Gandalf the Grey. It's really impossible to imagine anyone else filling this role. Viggo Mortenson is great as Aragorn, the self-exiled rightful heir to the throne of Gondor. Orlando Bloom, Liv Tyler, Cate Blanchet, and Hugo Weaving all make outstanding elves, and Jonathan Rhys-Davies is quite fun as the gruff dwarf Gimli. 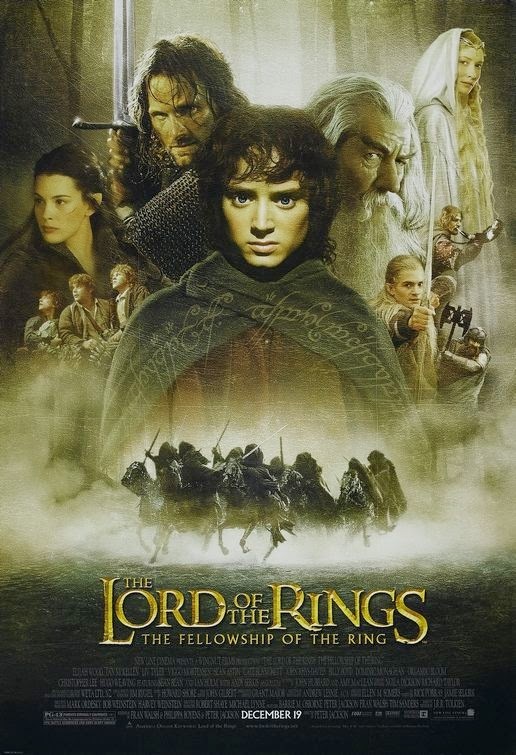 Frodo and the fellowship wander through forest and stream and land and hill to destroy the one ring against all odds in this ultimate tale of adventure and redemption by overcoming war and temptation. Like all epics, there are tons of characters and settings and it's impossible to give each one the true attention they deserve in this review. You can really tell this was a passion project for all involved and it took a great leap of faith for the studio to fund the film, especially considering all three parts were filmed at the same time over a year-long shooting schedule and took a commitment of hundreds of millions of dollars to make. Not only this, but Peter Jackson was mainly known for some low budget films in New Zealand at the time, and the only major production he had been involved in was the horror comedy "The Frighteners." The gamble paid off handsomely and in the most wonderful way possible for Jackson and company. It is hard to critique a movie that is so perfect. Each character and setting and place and problem and adventure is introduced brilliantly, beginning slowly and eventually building up enough intrigue and tension to a series of endings that we won't soon forget. It is worth every laugh, every smile, and every tear for the visionary direction and immaculate storytelling by Peter Jackson that unfolds right before your eyes.